It’s that time of month again when all my freelance deadlines come crashing down in a perfect storm of crunch that I’ve never really got the hang of handling. At least many of my sources were spared from the usual Thursday-night rumor grubbing. Much of the gossipy, wild stuff is all out in the open this week anyways so it’ll be a shorter one this week. Welp. It seemed that talk about an imminent organization in the House may have been a little premature last week. There are still backers of a committee of the whole-style power sharing agreement to get things underway in a better-than-nothing sort of way in the House, but it sounds like any decision—like all things in the Legislature this year—might just have to wait until Feb. 13. As highest-paid-of-Gov.-Michael-J.-Dunleavy’s-first-round-of-hires Office of Management and Budget Donna Arduin has been reminding inquisitive legislators for the past two weeks that’s the day that the budget—and the rest of the governor’s priorities—will be available to anyone outside the third floor. With the governor pledging to make somewhere in the neighborhood of $1.6 billion in cuts to “match expenditures to revenues,” it sounds like that’s going to be a bigger dividing issue than the political battle lines that have been drawn. The worse the cuts, the bigger the bipartisan caucus might be. And you don’t have to look much further than the governor’s proposed $20 million education cut to see legislators uniting. From what we’ve heard, there’s been a lot of talk among both Democrats and Republicans in both chambers for the that the Legislature will need to shoot for a budget that can pass with a veto-proof majority. That’s, of course, because Dunleavy has line item veto power over the budget with the ability to reduce or eliminate anything he sees fit. It’s expected, however, that some of the bigger cuts will require changes to state law. There’s dozens of options on the table. Dunleavy, of course, can’t increase the budget on his own so the supplemental spends for both the regular PFD and the PFD payback plan are places where the Legislature could wield some leverage over a governor who’s seemed less-than-interested in working with the Legislature. The $20 million education cuts and the three proposed constitutional amendments certainly didn’t win a ringing endorsement of moderate Republican Sen. Gary Stevens, who called the amendments a “horrible idea” and his office ordered up a legal memo questioning the legality of the Dunleavy administration’s decision to hold onto the $20 million and not disburse it until the Legislature has sounded off. 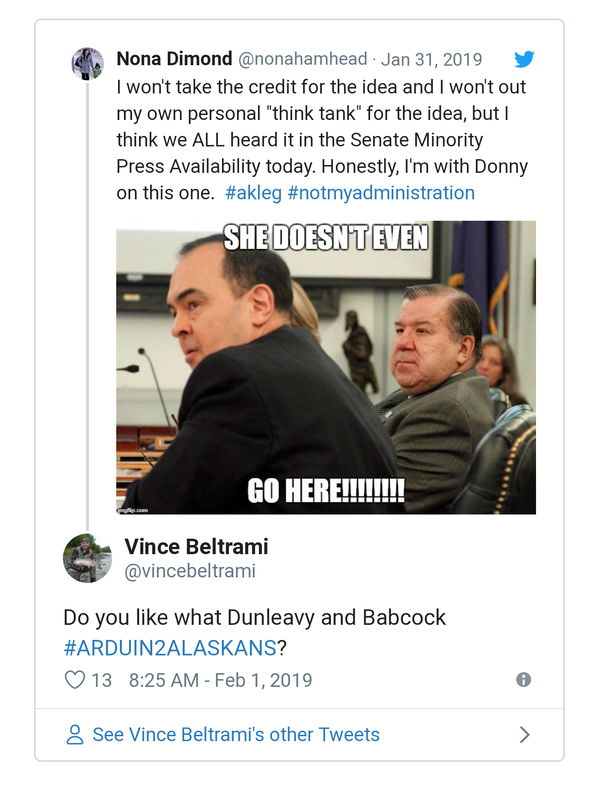 Though some might dismiss Stevens as a moderate member, it sounds like he’s not the only Republican down in Juneau with concerns about the Dunleavy administration. And even though Sen. Donny Olson is certainly the most vocal legislator about his dislike of Arduin’s budgeting so far he’s also not alone. Down in the majority-free chamber down the hall, Republican Rep. Tammie Wilson continues to score high marks from her peers for stepping up as a still-conservative, but more reasonable Republican. That has a lot to do with Wilson’s frank assessment that there really isn’t room for $1.6 billion of cuts, let alone in a single year (perhaps that has something to do with Wilson’s work in working with her constituents more than just about any other legislator). She’ll certainly back cuts—and big ones—but at least folks aren’t expecting her to be a rubber stamp on whatever the governor proposes. Meanwhile Rep. Lance Pruitt seems nearly giddy about the prospects of deep, draconian cuts. “I think that if people are surprised with this $20 million, then they’re going to have a heart attack on Feb. 13,” he told the ADN after the governor rolled out his supplemental budgets. Gov. Michael J. Dunleavy announced his pick to replace former Department of Administration Commissioner John “Can’t Tell Fact From Fiction” Quick, the very qualified Kelly Tshibaka. Tshibaka has 16 years in the federal government with an impressive resume that makes you wonder why she was the second pick in the first place. It seemed like a slam-dunk appointment for the governor, who’s been knocked down three solid times so far on his appointments. Then everyone—including columnist Dermot Cole—had to go and use Google. He’ll take home $139,000 a year, according to Cole’s reporting. Kelly and Niki Tshibaka are pastors in Washington, D.C., having started The Lighthouse Fellowship of the evangelical Foursquare Church. Neither are shy about any of this, and Kelly’s talked regularly about how it’s informed her work in government (which, for the record, seems impressive). Go check out the Anchorage Daily News’ story on the report for more. Politically, it’ll be interesting to see how the Dunleavy administration might get involved in trying to fix it. The conditions at API have already been strained by budget cuts and other on-the-job issues. And how will the rumored cuts to Medicaid—somewhere in the range of $400 million to $800 million among the numbers floated—impact it? There’s also the on-the-job issues we’ve heard of throughout state government that some described as a bullying culture under the Walker administration It’s a situation that spans across many different departments and seemed to be a product of infighting and budget stress. There was a lot of hope that a new administration would take it seriously. We haven’t heard much of an update on any of this since Dunleavy took office, and it sounds like there’s a pretty huge gap between Dunleavy’s political appointees and the rank-and-file staff. I guess that’s what happens when you don’t just fire the top levels of leadership and your loyalty-or-resign letters reach down multiple managerial levels. One person wrote in to describe the communication between the two “sides” as non-existent. But they are looking for wins. That might explain some of the bizarre budgeting so far. After giving Anchorage Republicans hopes all election season of picking up a Fairbanks House District, that’s how much Jim Sackett is making as Dunleavy’s Fairbanks office director. That’s just one of the many, many jobs and salaries detailed by documents published again by Dermot Cole. Go check out everything over here. Though Sackett’s job isn’t new—he just so happens to be replacing a person who held the job through four governors—there are a ton of new special adviser positions. Suffice it to say, the budget subcommittee process will be interesting. Expect a lot of scrutiny (and perhaps that’s why the governor would wait out the clock as much as possible on submitting the budget). Legislative per diem isn’t the only headache last session’s House Bill 44 will be creating for legislators this session. An ethics opinion on the legislation’s conflict-of-interest provisions was released this week and it’s wild. The rules have now been interpreted to bar any legislator from discussing or advocating a bill that raises a conflict of interest (PFDs don’t count) in private meetings with other legislators, constituents or anyone else. It’s stopped Sen. Shelley Hughes, whose husband works in the medical field, from taking any meetings with health care industry folks this week. She withdrew a health care bill, too. She is retracting her health care bill. Be the first to comment on "Friday and the Sun (Feb. 1): Everyone’s waiting for the 13th"